What is Skiing Without Après? I usually enjoy heading to Edgar’s Beers & Spirits (EBS) Lounge at the end of the day. This is at the base of the mountain in Snow Park Lodge and named after our founder Edgar B. Stern. There is a lot of history about him and his family and the development of Deer Valley. Also, you’re at the base of the mountain so if you get to comfortable there’s no worry about making the last chair. And it’s easy to get comfortable here because there is a big screen TV which usually has the hottest football game or some sort of World Cup ski event playing. On weekends, there is live entertainment. Here you can find something for everyone’s taste. If you’ve skied hard enough, try Edgar’s favorite drink, the Edgartini! Just one though! You still need to get back to the hot tub. Another spot is the BEACH at Silver Lake. This is at mid-mountain and directly outside the Silver Lake Lodge. You know you’re at the beach when you collapse into one of the white beach chairs. Of course this spot is better on some days more than others. When it’s a bluebird day it’s a perfect spot no matter the temperature. (Well, maybe as long as it’s not below zero!) The sunshine is beating down on you and you are looking up Bald Mountain watching other skiers and seeing the runs you have just conquered. Not a bad view! I have made this spot a tradition for closing day. 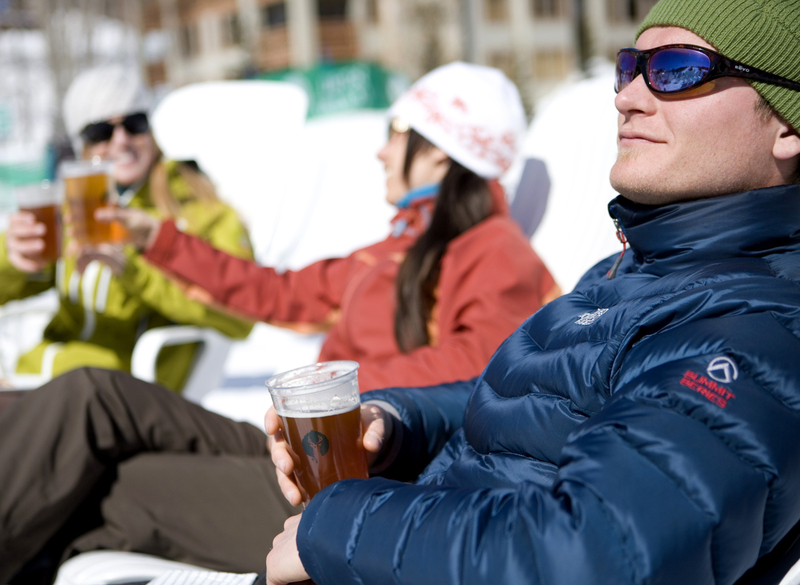 Grab a beer from the Silver Lake Restaurant and toast to the mountain for a great season or day. If you don’t want to be outside, Royal Street Café is also located at mid-mountain inside Silver Lake Lodge. Here you can enjoy all sorts of nice drinks including the most popular one on the mountain, Deer Valley’s Blueberry Mojito. Remember though, you at mid-mountain, so if you started at Snow Park you’ll need to make sure you get on the chair by 4:15. But if you’re staying at mid-mountain than you’re almost home! Your probably wondering what my favorite après drink is, I have to go with my regular Chardonnay. Those of you who know me I’m sure you’re laughing. I don’t change too much or shy away from my regulars; Skiing, Tuna Tacos, Chardonnay! I know I’m boring!! Cheers and See you on the slopes! We tried your suggestion about skiing Mayflower this am. Amazing! FREE Apres Ski Yoga at The Lodges at Deer Valley!